miraculous amaryllis, originally uploaded by jahansell. 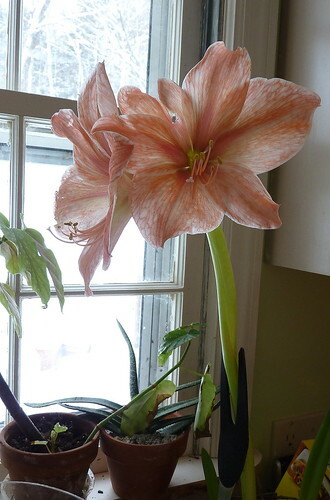 I've had this amaryllis bulb for quite a few years - 6 or 7, maybe. Every winter, after it blooms, I water it and keep it in the window. In the summer I put it outside, and in September I bring it in, cut off the foliage, and put it in the cupboard where it goes dormant for a few months. Usually I bring it out in mid-December, at which time it starts to bud, grow new leaves, and bloom. This year, I forgot to pull it out til last week. In complete darkness it had thrown up leaves and a stalk, and the flowers had started to open. But it was pale white, limp, and looked dead. I put it in the window, gave it some water and within about four days, it had gotten its strength back. The stem is broken a little and can't hold the weight of the flowers (you can see I have a kitchen implement propping it up!) but the flowers are spectacular - as good as if I'd been coddling it all along! So: the lesson? You tell me - in the comments! Why don't I go with one word: indomitable. Jack, a friend just adopted a puppy from the Little Guild. It had been neglected and abused - skinny and meek. But as soon as he went home wiht his forever family, his inner nature - joyful and loving, emerged, and he's been gaining weight and absolutely thriving. Life must live!